Dr. MOHAMMED MOSADDEGH brought down because he tackled BP, then known as Anglo-Iranian. AS BP boss Tony Hayward, under fire over the Gulf oil disaster, told astounded US congressmen that he had not been in the loop about what went on at the rig, they, and we, once again wonder at the ways of big business. If you really get on, you can not only earn a magnificent salary - said to be in the region of £6 million in his case - for supposed responsibility, but blandly claim that it's nowt to do with you, guv, the moment things go wrong. Forgetting Union Carbide's little Bhopal difficulty, Americans from right to left are complaining that Obama is too soft on the British company, while Brits are defensively saying this is unfair. We might note that Margaret Thatcher got rid of the British government's stake in BP, and the company merged with the American Amoco as it became more involved in north America. What is worrying many people here is the thought that their pension funds could be dependent on BP. "We've cleaned up BP's mess before"
What they are recalling are the events almost sixty years ago in Iran. British oil interests developed in that country before the First World War. Burmah Oil established a subsidiary, the Anglo-Persian Oil Company, later Anglo-Iranian, which raised capital by selling shares. In 1913 they built the oil refinery at Abadan. The same year they gained an important ally in Winston Churchill, at the British Admiralty. The Royal Navy switched from coal to oil, and the British government became a major shareholder in the company. By the late 1920s, discontent was growing in Iran over the way Anglo-Iranian(AIOC) operated with its monopoly, keeping the best jobs for Brits rather than training Iranians, and sending crude oil out rather than establish more advanced industry in Iran. The company made sure its biggest profit showed outside, paying its taxes in Britain and only a measly royalties to the Iranian government. A 1933 agreement was not seen as satisfactory, and the AIOC broke it anyway. The oil company was highly profitable, but its Iranian workers were poorly paid and lived in squalid conditions. In March 1946 oil workers struck, demanding better pay and housing, and health care. On July 14, 1946 they went on strike again in Abadan. Despite a military curfew, the strike went on for three days. Police clashed with demonstrators. Britain's Labour government, with a 50 per cent holding in AIOC, was not on the workers' side. It had already expressed concern over peaceful May Day demonstrations in Iran that year, saying it was worried over Soviet influence. Now the Royal Navy was deployed and stationed at the shores of Arvand river. Attlee's cabinet met on July 15, and approved a proposition to deploy troops to Basra, across the border in Iraq, just in case. The Iranian government insisted it was in control, but meanwhile Anglo-Iranian was bribing tribal leaders in Khuzestan, to provide strike breakers, and the tribal forces were also armed by Britain. British Foreign Secretary Ernest Bevin, a former general secretary of the Transport and General Workers Union, criticised Iranian prime minister Ghavamossaltaneh for not keeping down left-wing groups, and said that the oil workers were better paid than the average in Iran. The public feeling in Iran grew. The government could look enviously at Saudi Arabia where, with much less needs to provide, the regime enjoyed a 50-50 revenue split with Aramco. 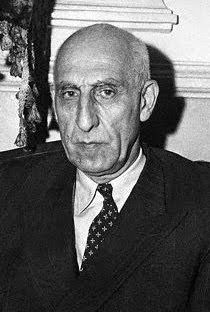 On 28 April 1951, the Majlis (Iranian Parliament) named Dr. Mohammed Mosaddegh as new prime minister by a vote of 79–12. Aware of Mosaddegh's rising popularity, the young Shah appointed him. On 1 May, Mosaddegh nationalized the AIOC, cancelling its oil concession due to expire in 1993 and expropriating its assets.
" With the oil revenues we could meet our entire budget and combat poverty, disease, and backwardness among our people. Another important consideration is that by the elimination of the power of the British company, we would also eliminate corruption and intrigue, by means of which the internal affairs of our country have been influenced. Once this tutelage has ceased, Iran will have achieved its economic and political independence. The Iranian state prefers to take over the production of petroleum itself. The company should do nothing else but return its property to the rightful owners. The nationalization law provide that 25% of the net profits on oil be set aside to meet all the legitimate claims of the company for compensation…"
The British government was unwilling to negotiate. Anglo-Iranian withdrew its technicians and tried to close the Abadan refinery, something the Iranians had been accused of. The company set about organising a worldwide boycott of Iranian oil, and the Attlee government sent the Royal Navy into the Gulf to make it a blockade. The army was prepared to seize the Abadan refineries, although the Truman administration in Washington tried to caution its ally. With Churchill coming back to government in Britain, war seemed more likely, and the new Eisenhower administration in the US was ready to back Britain. But it did so by different means. First the CIA urged Shah Reza Pahlevi to sack Mosaddegh, and when this did not work, it paid a combination of gangsters, clergy, corrupt politicians and army officers to bring about chaos, and a coup. While the Shah fled abroad, on August 19, 1953, a royalist mob led by thugs hired by the CIA marched on Mosaddegh's home. Mosaddegh was arrested, tried and convicted of treason by the Shah's military court. On December 21, 1953, he was sentenced to solitary confinement in a jail cell in Central Teheran for three years, then placed under house arrest for the remainder of his life. The Shah had returned in triumph accompanied by Allan Dulles of the CIA. The minister of Foreign Affairs and the closest associate of Mosadegh, Hossein Fatemi, was executed on Oct. 29, 1953 by order of the Shah's military court. The Shah also ordered the execution of military officers and student leaders who had been closely associated with Mosaddegh. He set up the notorious Savak secret police with American help. But having saved Anglo-Iranian, or British Petroleum as it became, the Americans did not content themselves with feeling satisfied. The British company's monopoly on Iranian oil was replaced by an international consortium, under the name National Iranian Oil Company, in which Anglo-Iranian as was now held just 40% of the shares. The consortium agreed to share profits on a 50-50 basis with Iran, "but not to open its books to Iranian auditors or to allow Iranians onto its board of directors." The lion's share of Iranian oil now passed into the hands of other Western companies, notably the US, Rockefeller-owned Standard Oil. By a coincidence, US Secretary of State John Foster Dulles and his brother Allan at the CIA were both in the law firm that looked after Standard Oil's interests. And Kermit Roosevelt, who managed the coup in Iran, left his CIA post later to join the board of Gulf Oil. The Shah's regime lasted a further 26 years before it was brought down by a popular uprising, in which the oil workers played an important part. Sadly, though for a time they controlled the refineries, they did not have a political party that could take the power, and it was the Ayatollahs who reaped this. The strong anti-American feeling on which they could count did cause some US rulers to regret past deeds. In March 2000, Secretary of State Madeleine Albright said: "The Eisenhower administration believed its actions were justified for strategic reasons. But the coup was clearly a setback for Iran's political development and it is easy to see now why many Iranians continue to resent this intervention by America." In the same year, The New York Times published a detailed report about the coup based on declassified CIA documents. Dr.Mosaddegh remains a popular historical figure to many Iranians, as a democratically elected and patriotic leader who sought to act against the foreign exploiters and for his people's good. Ironically, however, the Islamicist regime for all its demagogy prefers not to see his name celebrated officially or taught about positively in schools. This may be because the clerics never liked Mosaddegh as a secular leader with western culture, but also because they, like the British government, considered the communists a real threat. It was the turn against Mosaddegh by Ayatollah Abol-Ghasem Kashani and other clergy that undermined his support from the lower middle class and religious masses, and helped Iran's imperialist enemies impose the Shah's regime. Too much memory is dangerous for those in power today.